People can have some crazy dreams. One of our dreams was to create a costume based on the classic Edgar Allen Poe piece, The Raven. Unfortunately, we had some difficulty catching and training a raven. They’re actually quite smart and don’t have any interest in helping us make an Edgar Allen Poe themed costume. Also, we found out that keeping a raven as a pet is a no-no in these parts, so, needless to say, it didn’t work out trying to use real ravens! We thought our dream was lost, but then we put on our thinking caps on and we found the perfect accessory to complete our costume. 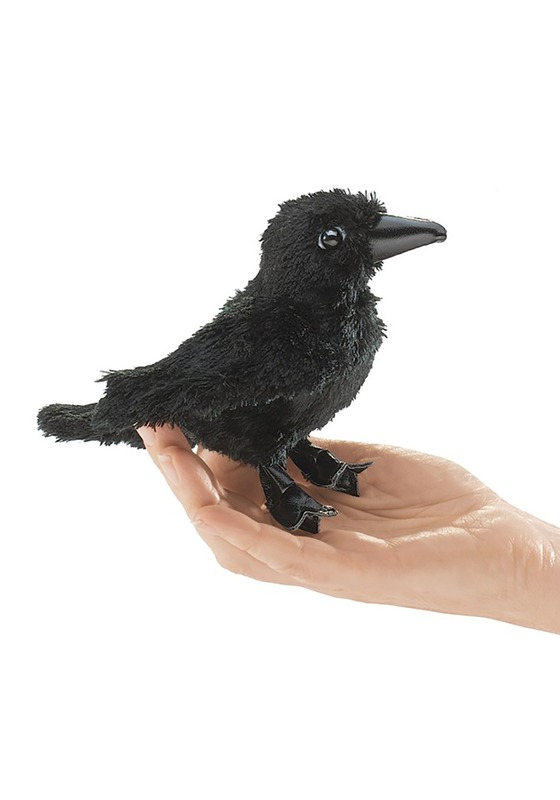 This adorable Folkmanis Mini Raven Finger Puppet, provides you with a toy raven that will comply with your pursuit of an Edgar Allen Poe costume! This simple puppet is about 5 inches long and is covered in a fuzzy, faux feathery material. It had a 7-inch wingspan and has a small compartment for you to place your finger inside. He also has a plastic beak and a pair of matching eyes. If you’re like us and want to recreate The Raven in costume form, then this little puppet is a must. If you just need a new puppet to add to your puppet show, then this puppet is also a must. Maybe you could even do a puppet show based on Mr. Poe’s works!